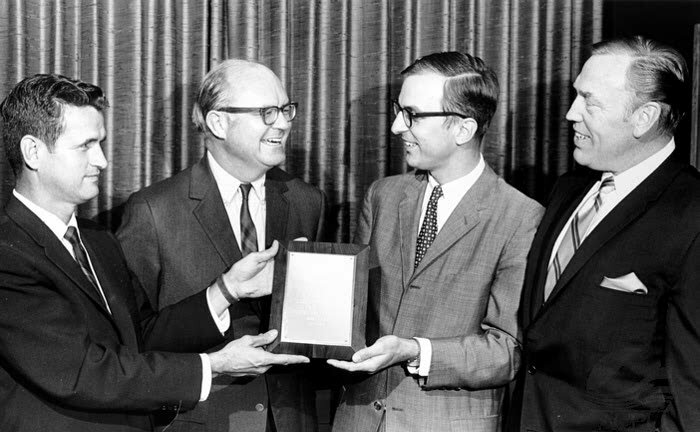 Thomas Moorhead (far right), Minnie Kryder's Estate Attorney and Frank Kryder's Vice-President of the Kryder Company until 1970, stands around in 1969 with other new and past officers of the Allen County Bar. Also housed in the Collection: Fort Wayne's (Summit City) Redevelopment Project in 1969. 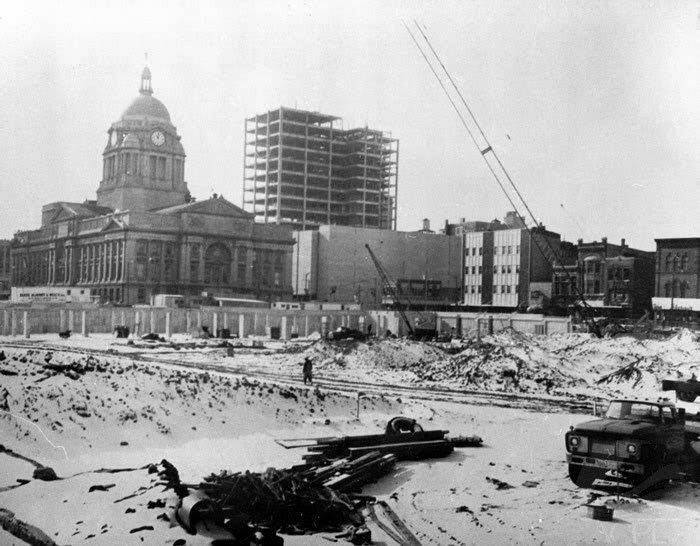 The Allen County Courthouse can be seen in the background, flanked by the new Ft. Wayne Bank Building under construction. Also part of the redevelopment project was the construction of Freimann Park with funds from the Frank Freimann Charitable Trust, which was housed in Fort Wayne National Bank as an unsupervised Trust contrary to the Will of Frank Freimann. Fort Wayne National Bank is now National City Bank. National City was recently awarded the U.S. Military banking contracts. Moorhead and Bordner's, then Bordner and Felger's Legal Assistant told the PR many client records were burned before Bordner moved into the new Bank Building and perhaps that's what happened to the Kryder Company, Inc. corporate records. Bordner died in 1987, but when queried by the PR as to the burning of the books, Felger quickly attempted to correct the Assistant's boo-boo.